A mysterious invitation to the launch of an unknown beer, a collaboration from two internationally renowned breweries, in the crypt of a church down a hidden street in old London town. Well it would pique the interest of any beer lover. Down in the belly of the church we could have been hidden in a secret bar under the Grand Place in Brussels, sipping on Chimay Red and snacking on cheeky deep fried mussels and aged Chimay cheese being offered up on the trays of Belgian waiters. 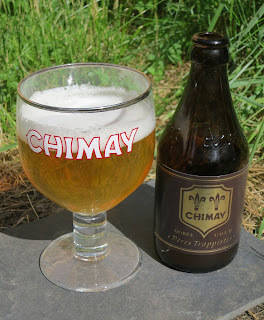 The main announcement came, the reason we were here, the launch of Chimay Gold, a 4.8% pale ale. The monks' own beer is a light and refreshing ale, spiced with coriander and orange. It falls somewhere between a pale ale and a Belgian Wit but with the unmistakable Chimay yeast character giving it fruity flavours of tangerine and apple. It is both creamy yet zesty and spicy which makes it perfect with rich cheese or even with a barbecue as I'm enjoying this bottle today. Fullers are now importing all the Chimay beers including Gold and it is available on draft from a number of Fuller's London pubs and in bottle around the country. The list of London pubs is here.